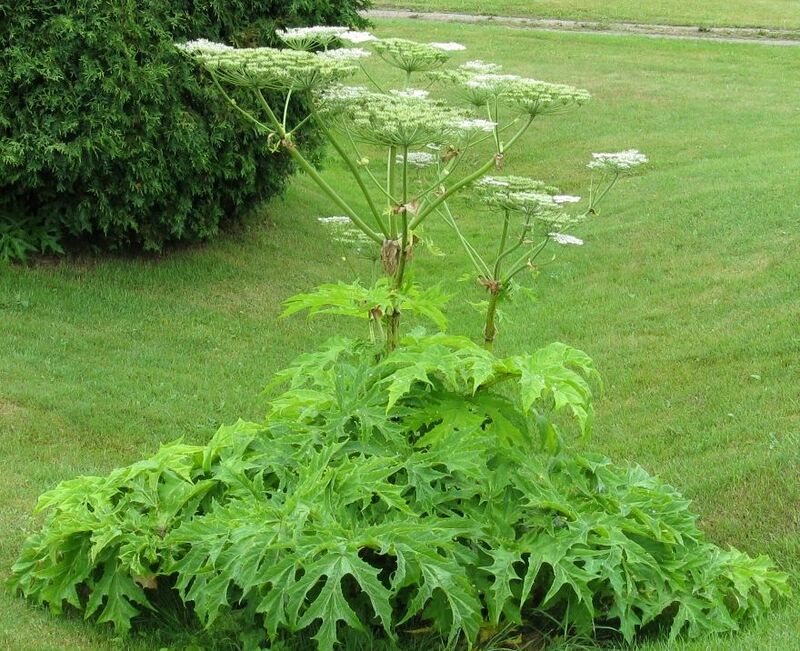 There are several variations such as ‘Giant Hogweed’ which can grow several feet tall. This is also a very dangerous plant which can cause burning severe blisters and even blindness. People are advised if it's found in the garden to not touch it without wearing full PPE (plant protection equipment). Hogweed (‘Cow Parsley’ or 'Cow Parsnip' as it is sometimes known) is another variation, it is a very invasive plant that has a flower that is white, and the stem of the plant can be very tall. Giant Hogweed can be identified by its bright green stem that has dark red spots. Stems can grow more than 2m high and also grow white flowers in clusters. Hogweed / Cow Parsley can easily be identified by the long-stemmed white flower that produces a clear sap. It is often seen on road verges across the country. These can usually be found in and around June to July time. Giant Hogweed produces a phototoxic sap which can cause serious skin inflammations, burns and blisters. Hogweed can be a very dangerous plant which can harm not only human but animals aswell. It spreads quite quick across land. It is also an offence to allow the plant to spread into the wild so needs to be controlled. Cutting it back will manage the population but if it is not killed it will just force the plants energy into rooting deeper. A targeted herbicide application is the only way to really control it for good. You either need to apply a strong glyphosate-based product such as Roundup Pro Vantage 480 early spring with repeated applications as and when new growth appears or wait until autumn time and inject the neat Roundup directly into the stem of the plant using a stem injector. This will then take the Roundup deep into the root system as the plant naturally senesces (dies back) for the winter.